When selecting a watch, it’s important to seek the right fit. Whether you’re a business professional or a retiree on the go, finding the perfect wrist accessory is about discovering a piece that will enhance any ensemble, function as a fashion item and do the task of timekeeping. The Chocolate Sky-Dweller is the watch that checks all the boxes and meets the demands of a busy and hectic life. 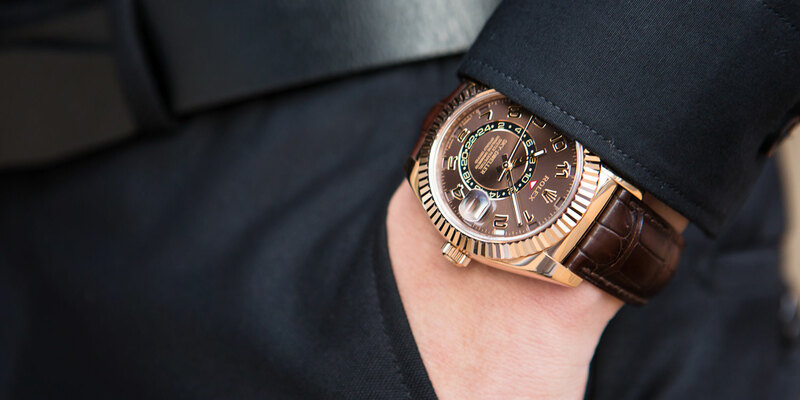 The Chocolate Sky-Dweller is a watch that can be worn for those who want to look their best. Released as the first new watch from Rolex in the past 20 years, this special timepiece is the first to boast an annual calendar with dual time zones; it also features the ring command bezel, which can be used to set the date, time and reference time. In addition to the bidirectional rotatable ring command bezel, the automatic Rolex caliber 9001-movement and Saros annual calendar are among the Rolex Sky Dweller’s most notable and in-demand features. Beyond its functionality, this attractive watch also is distinguished member of the Rolex family for its chocolate dial with an everose bezel and rose gold-tone hands. In addition, this unique wristwatch boasts a 72-hour power reserve, making it even more practical and valuable as a timepiece for global traveling. The Chocolate Sky-Dweller is easily a watch that is fashionable. Anyone can wear the watch and look great. The sleek style of this coffee colored watch makes it more of a standout in a sea of sophisticated wrist wear and it has retained a reputation as one of industry favorites. The luxurious leather strap in a deep brown, along with the easy-to-read chocolate dial and distinctive gold hour markers make this classic watch, launched in 2012, even more memorable. Styling this handsome watch is easy—opt for classic neutrals, like a black cotton crewneck sweater with flat front slacks in charcoal or go for black on black with a lightweight dark sweater vest, a colorless button-down and a pair of jeans. Finding the right fashion look is easy with a watch of this caliber. This Sky-Dweller has its favorable traits, so be sure to learn more about this killer watch. Clearly, it’s easy to see why there are over 10 patents for the stunning technological design and unparalleled sophistication of the Chocolate Sky-Dweller.